How to become a werewolf? Rules: Everyone has an own opinion, so please no fights about others opinion. You can have a discussion, but if you are in a fight or have beef with someone, don't bother us with it. Handle it in Private Messages. No bullying about whatever, if you don't like our site, then just don't visit it again, and no rude comments about our site. So just be nice to each other. 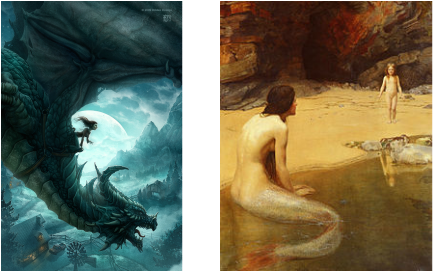 Magical Creatures: Mermaids, Vampires, Werewolves, Dragons, Aliens, Fairies, is it real or not? I don't know. But i believe in all of them. (Especially Aliens mermaids and vampires!) I don't believe the folklore, like vampires burn in the sun or that mermaids become them when they touch water. You can believe them, but i don't. But yeh, i'm gonna talk about them and teach you how you can become one of them. About me: I'm a girl, I live in Europe and I am awkward, haha yes! I love youtubers and magical creatures. I really hope that i can build a strong community. And i also hope that everyone is gonna help me and others with their problems, and with their questions about those creatures. I just hope that i can build a strong family. You can't become an alien but i'm very interested in them so that's why i've put it in the list and it's a monstrous creature. Thanks. All the information is coming from google, myself and many sites. I'm just making this site where you can find it all in one. My English isn't always that good sorry.